In its native Central America loss of habitat has reduced the Great Green Macaw’s (Ara ambiguus) population to less than a thousand. In Ecuador, it is fairing far worse. Progress and outcomes: Since the mid-1990s the World Parrot Trust has supported several in-country organisations to help save the species. 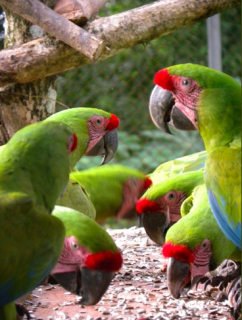 Projects include protecting unique lowland Atlantic forest in Costa Rica, funding Fundación ProBosque for an honorary warden program to protect the macaws in Ecuador, and partnering with The Ara Project (as of 2019 Ara Manzanillo and Macaw Recovery Network, two separate entities) in Costa Rica, and Fundación Ecológica Rescate Jambelí in Ecuador to help increase Great Green Macaw populations through captive breeding, rescue, release, and reforestation efforts. In 2016, Fundación ProBosque, in conjunction with Jambelí Rescue Foundation, released a total of five Great Green Macaws (Ara ambiguus) to the wild after a stint in a pre-release flight. In Costa Rica, WPT collaborates with Ara Manzanillo on the Caribbean coast, and Macaw Recovery Network at Punta Islita on the Pacific coast. In 2017-18, a group of released Great-green Macaws fledged 12 chicks in artificial nests, and in 2018 the numbers have increased to 16 chicks. Wild Population: Fewer than 3700 individuals. Where found: A.a. ambiguus: Caribbean lowlands of E Honduras to NW Colombia. History: Once prevalent throughout the entire Caribbean, Great Green Macaw (Ara ambiguus) populations have declined alarmingly in recent years due to poaching and deforestation, in particular the cutting of Mountain Almond trees. BirdLife International states that over the past 50 years global populations have been reduced by half. A census conducted in the Cordillera de Chongon Colonche and Esmeraldas Province in Ecuador in 2010 found only 8 birds, with the current population in all of Ecuador suspected to be 30-40 birds (E. Horstman in litt. 2012). Recent conservation efforts in Costa Rica have stabilized numbers with less than 300 birds and an estimated 25-35 breeding pairs remaining (PsittaScene Aug. 2011). Ecology: This macaw prefers lowland humid forest and also strongly deciduous forest; in Costa Rica lowland primary forest. It is found at altitudes to 600m (1968 ft) in Costa Rica and1000m (3280 ft) in Panama. Less gregarious than other large macaws, it is found in pairs and groups of 3-4 birds, foraging on fruits, nuts, bulbs and flowers.